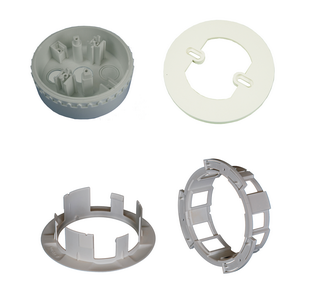 The Time Saver Ceiling Tile Adaptor is used with the 4B 4” detector base snap fit base and consists of three parts, a bezel and clamp that are fitted to the ceiling tile and a back-box that carries the detector and base assembly. Requires a 127mm diameter hole. The CTA adaptor plate allows to be used with other devices such as the FC430SB.